Outdoor Wood Furnaces: What Pipe is Best for an Outdoor Wood Furnace: Pex vs. Pex-al-pex. What Pipe is Best for an Outdoor Wood Furnace: Pex vs. Pex-al-pex. Throughout the outdoor wood furnace industry there are mainly two types of pipe used for installations, pex and pex-al-pex. Other options might include copper or CPVC. Copper can get really expensive, really fast. CPVC is more affordable but can be time consuming to install. When running pipe underground, neither of these options offer the flexibility that is so nice when using pex or pex-al-pex. The basic pex pipe is cross-linked polyethylene. Pex is widely accepted in and available at most home centers. It's a great option for domestic water installations. Most commonly, crimp rings are used to pinch the pipe around the brass fittings. Compression fittings are also available. Pex-al-pex (also known as pex-al, pexal or p.a.p.) is a five layer pipe composed of plastic, adhesive and aluminum. Crimp and compression fittings are both available for pex-al-pex pipe. Both pex and pex-al-pex can look very different when installed. The flexibility of the pipe allows for sweeping curves. Some people dislike this look and find it sloppy. Others enjoy the "organic" feeling. Most people don't notice either way, it's just pipes in the basement. The sweeping curves do offer an advantage. Every elbow used to run water pipe creates friction. Eliminating some or all elbows can increase water flow. Increased water flow increases how many BTU can be carried to heat exchangers. When used with water at high temperatures, such as outdoor wood furnace applications, expansion is to be expected. Regular pex has a very high expansion ratio; 1.1 inch per 100 feet per 10° F. The installation specs require 1/8th inch of slack for every installed foot of pipe. This expansion creates dramatic droops in the installation. A nice, neat set of lines looks like limp noodles. Aesthetics aside, this expansion can also cause problems. 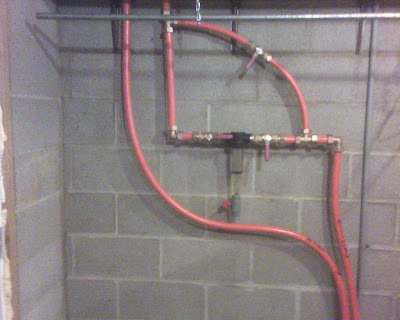 When pex line is used in underground pipe the expansion becomes compressed. Imagine 100 feet of line underground contained by foam or foil-wrap insulation. 100 feet of line 110° F above the ambient temperature of the pipe can expand 6 to 7 inches laterally. The expanded line pushes against the pump and fittings attached at either end. Pex-al-pex lines have expansion properties similar to copper. There are no special considerations for expansion during the installation. When used with hot water the expansion is minimal. Lines maintain their shape and underground runs do not exert extra pressure on pumps or fittings. Pex-al-pex lines also have a full 1 inch inside diameter (ID) compared to 1 inch pex lines that have an ID slightly less than 7/8 inches. This difference in ID makes a big difference when transferring BTU with hot water. Transferring the proper BTU through the water lines is crucial to the performance of the heat exchangers used in an outdoor wood furnace system. Limit the ID and the BTU transfer is reduced significantly. Hawken Energy always recommends the use of 1 inch pex-al-pex lines. The advantages of this line outweigh the minimal savings of using standard pex. Hawken carries a full line of pipe and fittings available through your local Factory Rep or from our online store.